If you've completed the Give It To Me I'm Worth It Copywriting Course, I'm sure you're about a million times happier with your new copy compared to your old stuff. But sometimes, you want another eye on things. Sometimes there's that one line that no matter how you try to polish it, never feels quite right. Sometimes you notice that one page is converting really well, but another isn't converting as well as you want it to, and you can't quite put your finger on it. Or... sometimes you've used the principles you learned in the course to write something totally different from a website page... like a newspaper ad or brochure to use at networking events. And while you're pretty happy with it, you want to make sure it's as polished as possible before it goes to print. 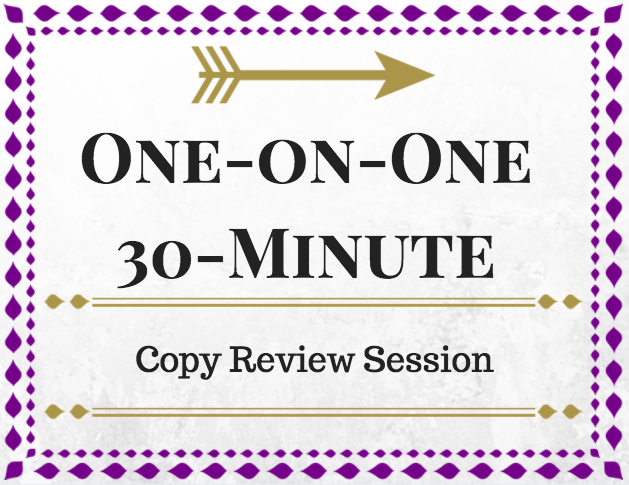 So if you like, we can book a 30-minute copy review session. We'll go over as much as we have time for in the 30-minute session, so make sure you send over at least 2 items. Deliverable PDF document includes instructions on how to schedule a meeting and share the copy you want to review.